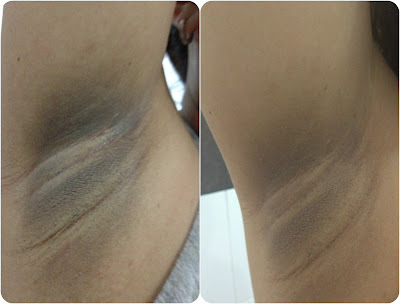 IAMBRIGITTE : Product Review: Gluta-C Underarm and Bikini Whitening Gel, the Conclusion! Sorry, for reposting this. I am not sure why it has been deleted, and people have emailed me asking for the link. Good thing I still have a draft....whew! 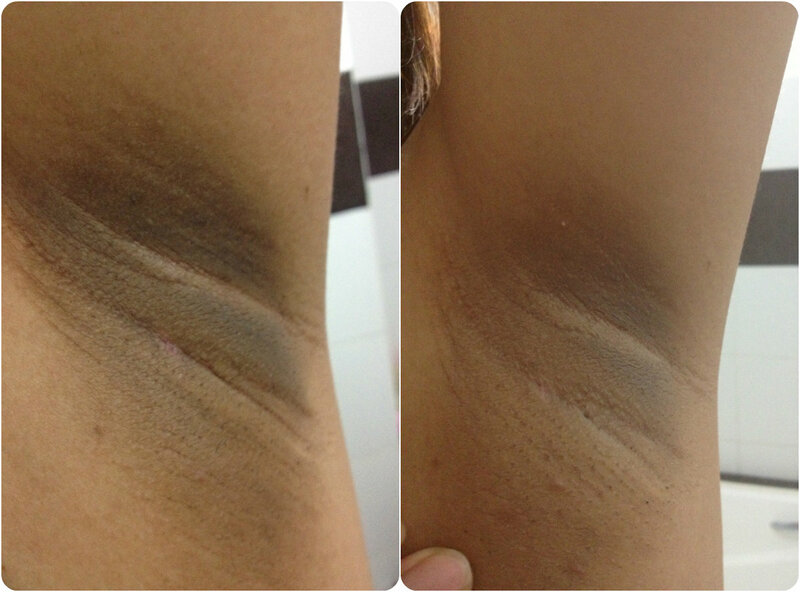 A few days ago, I've posted my review on Gluta-C Underarm and Bikini Whitening Gel here. I find the product effective, but since my underams are not that problematic, I decided to post the before photos of a friend who has been suffering from dark pits and who I think would better represent the product's effectiveness. Can you see that her "after" photos did show significant improvement? Take note that these photos are un-edited. 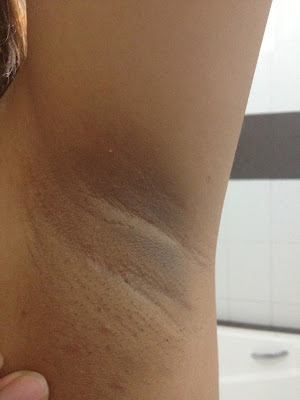 Her pits not only lightened, but the skin has become smoother too! The lines (creases) are not that deep anymore (probably because it has lightened), and the chicken skin has lessened. She's absolutely loving Gluta-C whitening gel, and I told her probably it would be a lot better if she use the soap too. I've heard a lot of raves on their soap, even my Tita uses it. It's been only more than a month, but her pits are a lot better than it used to. So I am sure, that with continuous use, she's on her way to having lighter, more even and smoother underarms. It might work for you too, so for those who have skin darkening problems, try Gluta-C Intense Whitening Underarm and Bikini Gel. It's cheap, and it works! And you can use it on your elbows, inner thighs and even on knees..anywhere you want to have lighter, even and smoother skin. Let's all get even with Gluta-C! wow. impressive nga! i'm gonna try this! Thank you for sharing this post. I have never heard of a whiting product for these areas, but it's brilliant! I'm going to try this myself! I've been using this product for almost 4 weeks now and I can say that I am satisfied with the result. My husband told me that my UAs are whiter (the only product that worked for me). Con: I am not using a deo on top of it that is why my UAs sometimes feel sweaty. Pros: whiter and smoother UAs. BTW, I also started exfoliating 3 times a week using a whitening salt scrub. Your review inspired me to try out the product a few weeks ago, so thanks. Being a blogger myself, I dislike the practice of trying to pass off other people's original photos as their own, without any credit. Just wanted to give you a heads-up on this. Nabasa ko po 'tong review nyo nung May or June pa po. Then kanina po.. habang nagf-facebook ako.. nakita ko po itong isang facebook page na nagbebenta ng mga kung anu ano. Then pansin ko po yung isang picture na ginamit at pinost nila as 'FEEDBACK' daw ng isang client nila.. eh parang familiar po yung picture na parang katulad po sa pinost niyo.. so hinanap ko po ulit itong review nyo na 'to at tama nga po ang hinala ko na sa inyo po talaga yung picture. 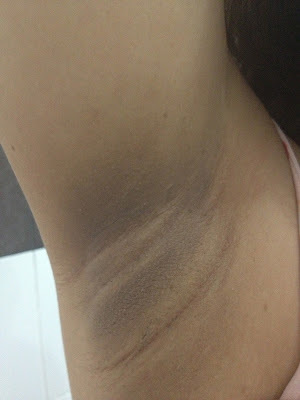 :( Gosh I never knew some women suffer from really dark underarms. I've been ranting pa naman with mine. sorry VMAGBOO but i do hope that next time try to at least verify information first before you say something like that. those images are originally from mine, and have been used by A LOT of people and claimed as their own. if you've read one comment from this post, you'd even see one of my readers gave me a heads up that somebody have used my images again. they were even used on Instagram by sellers. pwede b yan s buntis? hi po. how many months po bago niya na achieve ang ganyang effect?